Cambridge is just one of the many areas that Diamond Fun Casino provides top quality entertainment to. With a choice of diverse venues from historic colleges to modern hotel event spaces, the Cambridge venues have the versatility to host all Cambridge events and parties. 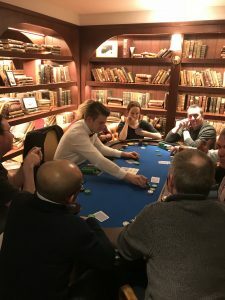 On the banks of the river Cam, King’s College has hosted events with professional casino & croupier hire from Diamond Fun Casino. The venue space is unique and the casino has been a hit in all areas that we have provided the entertainment in. A great place to stay and play with our casino hire in Cambridge. 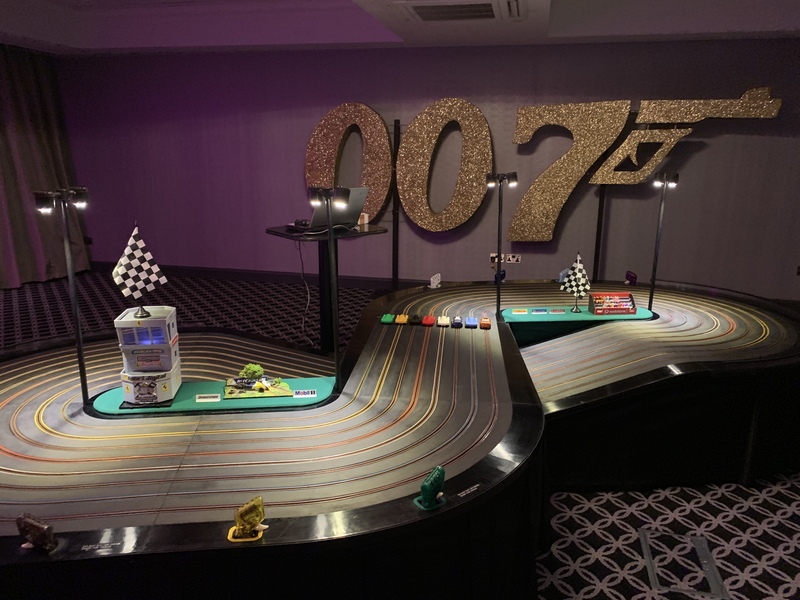 A recent corporate event here delighted the guests with our fun casino tables and professional casino croupiers, giant 8 lane Scalextric track with race attendants, 007 Bond themed illuminated props and mirror booth. It all came together to create a fantastic entertainments package with guests enjoying the games, the atmosphere and taking away fun memories from the mirror booth photos. 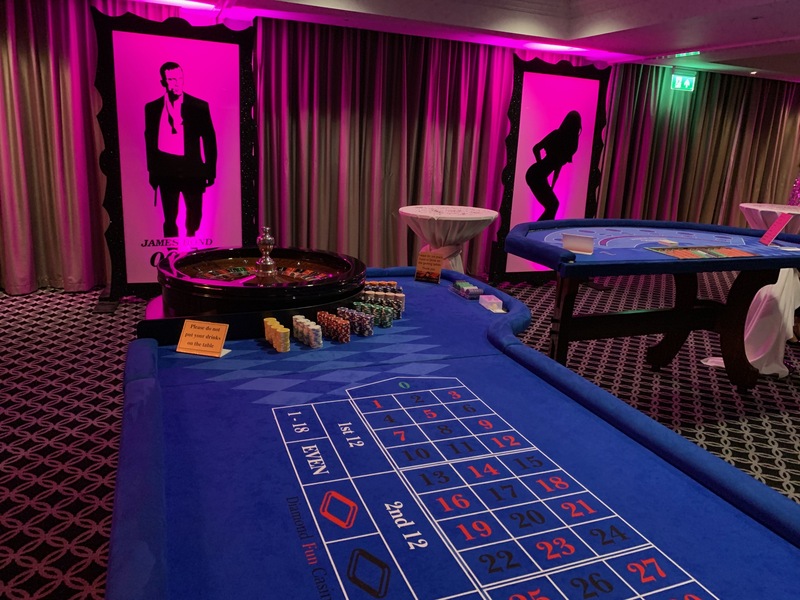 At another event in central Cambridge we provided the croupiers and fun casino equipment for a small corporate team building event. Delegates had the opportunity to learn how to play Texas Hold’em poker from our world class poker dealers and enjoy a fun tournament. There is no limit either large or small to what entertainment we can provide for, from a handful of delegates to an event with guest numbers in the thousands. This lakeside hotel on the outskirts of Cambridge was host to a corporate Christmas event. The client’s staff were treated to a sumptuous Christmas dinner with live music followed by some great competition on the blackjack & roulette tables. With a Las Vegas theme our giant 10ft x 10ft Vegas backdrop set the scene for an evening of excitement. Another unique venue we have the pleasure of providing our fun casino for in Cambridge. An annual fundraising ball brings us here to help raise funds for charity. As well as the fun casino tables including roulette and blackjack guests have had the opportunity to compete against each other to gain the fastest time to complete our giant buzzer game. Our mirror booth has also delighted the guests to have some fun with the props and take home some photos of their fun evening. Just to say a massive thank you!! We had an amazing time and loved the casino and everyone got very competitive!